Before even hoisting their packs for an overnight trek to Lost Lake, some hikers think their already lost. At the Pine Valleys Pathway parking lot there are signs and directional arrows for snowmobiles, off-road vehicles, and cross-county motorcycles, leading many to wonder whether they are even at the right trailhead. But half hidden in the back of this staging area for motorized activity is what you’re looking for; the start of the Pine Valleys Pathway. 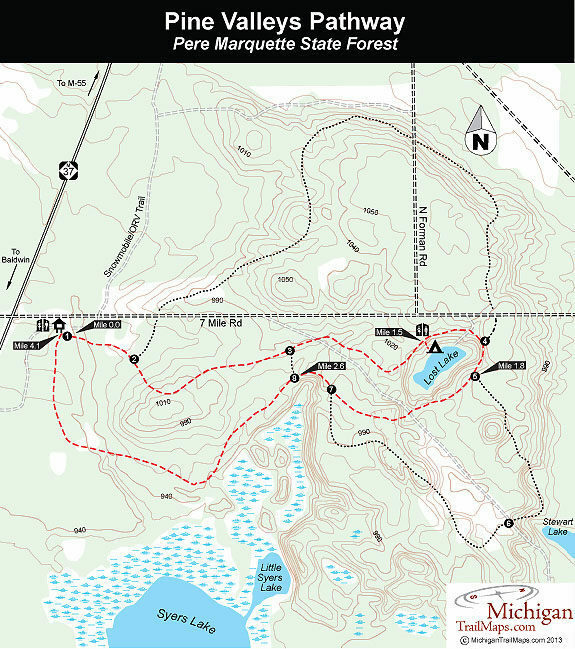 Before there were snowmobilers and four-wheelers racing through this section of the Pere Marquette State Forest, there were hikers and skiers. Pine Valleys was built in the mid-1970s when Nordic skiing was booming in Michigan and the Forest Management Division was building trail systems to accommodate skinny skis. But at Pine Valleys planners also added a walk-in camping area at Lost Lake and soon this pathway became as popular for backpackers looking for an overnight adventure as for cross-country skiers. Eventuyally mountain bikers also discovered this series of loops. Located 13 miles north of Baldwin, the pathway is a system of three interconnected loops that total 8.2 miles. The southern loop was heavily clear cut in the late 1980s and today still resembles a match stick forest of aspen. The northern loop is bisected by two-tracks, snowmobile routes and the Little Manistee Trail used by ORVs. Mountain bikers often choose to follow the premiere of the system for the most mileage possible, a ride of 6.1 miles. 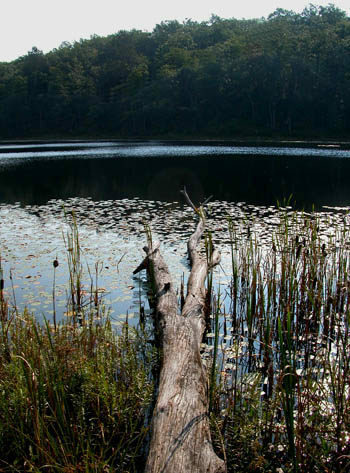 For hikers, however, the middle loop is a gem, a forested path that leads you on a 4.1-mile hike to the lake and back. Here you are isolated from the nearby motorized activity and can enjoy a quiet evening camped along the shores of Lost Lake. While this portion of the pathway does attract an occasional mountain biker or horseback rider from a camp on Stewart Lake, chances are good that you will have the trail as well as the lakeside campground to yourself throughout most of the summer. Pine Valleys Pathway is marked with a series of numbered posts laid out in a clockwise direction and half hidden in the back of the parking area, marking what is usually an overgrown path, is post No. 1. Head east (left) to reach post No. 2 in 0.2 mile. This is the junction where the northern loop splits off to the north (left). The middle loop continues to the east (right) and becomes a wider trail to handle skiers in the winter. The hike also becomes more hilly as you gain elevation on the way to post No. 3, reached at Mile 0.8. This post marks a short crossover spur south to post No. 8 along the return trail. At this point, the middle loop follows an old vehicle track before veering to the right to cross the dirt road to Stewart Lake. The pathway is clearly posted on both sides. Beyond the dirt road, the pathway swings to the southeast and at Mile 1.4 you climb a bluff for your first view of Lost Lake. The trail skirts the bluff high above the lake briefly before arriving at a pair of vault toilets. From here a path descends to the five lakeshore sites. The campground has no amenities as the vault toilet and the hand pump that once existed here have been removed. Pack in water or filter what you use from the lake. Despite the lack of luxuries, Lost Lake is a wonderful spot to pitch a tent. 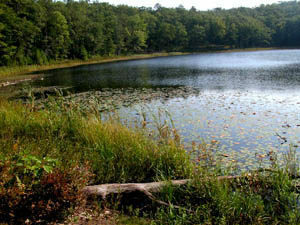 The small lake is less than a 1000 feet in length but enclosed by 60-foot-high bluffs forested in a variety of hardwoods. Even when there is a wind, the lake is usually quiet and still, its lightly rippled surface often reflecting those shoreline colors. In the morning you'll want to linger at Lost Lake, watching the sunrise spread across its surface while savoring a second cup of coffee. Go ahead and linger. The return trip to your car is a walk of only 2.6 miles. Resuming along the top of the shoreline bluffs, the pathway continues to skirt Lost Lake with many unofficial paths leading down to the water and either made by hungry beavers or anglers. You soon skirt 7 Mile Road, seen through the trees, and in less than a quarter mile arrive at post No. 4, where the northern loop re-enters. The trail continues to traverse the lakeside bluffs, and at Mile 1.8 from the campground, arrives at post No. 5. The fork heading south (left) is the start of the southern loop, which leads to Stewart Lake, a small body of water with cottages and a church camp on it that is reached in 0.6 mile. The southern loop then returns to the middle loop at post No. 7, though you have to stomach some clearcuts. To remain on the middle loop head west (right) from post No. 5. It immediately begins a nearly half-mile descent bottoming out at the dirt road to Stewart Lake. From there, it remains a forested walk, reaching the locator map at post No. 7, at Mile 2.4 or a mile from the campground. Post No. 8, one hill and 0.2 mile away, is quickly reached and then the trail swings southwest to arrive at what appears to be a flooded pond. Actually, it's an arm of Little Syers Lake that has been heavily dammed up by beavers and now attracts a variety of wildlife, especially birds and waterfowl. The trail swings away from the lake on an old logging track that arrives at a wildlife project. The grassy clearing is a planting of rye grass for the benefit of deer (and thus hunters), which feed in such open areas. The trail never crosses the clearing but rather skirts the edge of it. Keep an eye out for trail markers as the pathway crosses three logging roads and cuts through a second rye grass clearing during the next half mile. Eventually the trail swings near M-37, where at times it's possible to the traffic rumble by, then returns to post No. 1 in the trailhead parking area, reached 1.5 miles from post No. 8. In the trailhead parking area you’ll find a display board and vault toilets but no source of drinking water. At Lost Lake Walk-in Campground there are five campsites and a vault toilet but again no source of drinking water. Pack a filter if you’re spending the night. 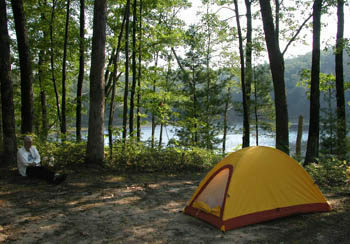 There are no vehicle entry fees and camping is free at Lost Lake. The pathway is in the northern portion of Lake County, 13 miles north of Baldwin or a half-hour drive west of Cadillac. From M-55, head south for 9 miles along M-37, then turn east onto 7 Mile Road, The trailhead and parking area is a large, grassy area on the south (right) side of 7 Mile Road, a quarter mile from M-37. The DNR Cadillac office (231-775-9727) is located just north of town on M-37 and is open 8 a.m. to 4:30 p.m. Monday through Friday.